Born in Warneton on 8 June 1798 into a family of Belgium artists, Eugene Joseph Verboeckhoven was trained in his father's sculpture studio. As a boy he learnt drawing and clay modelling alongside his younger brother, Charles Louis Verboeckhoven. They studied the anatomy of various animals by modelling and drawing them. In July 1816 the family moved to Ghent where he studied at the Academy of Fine Arts. After 1818 Verboeckhoven worked with landscape painter, Ommeganck, studying the work of Nicolas Poussin and Claude Lorraine. 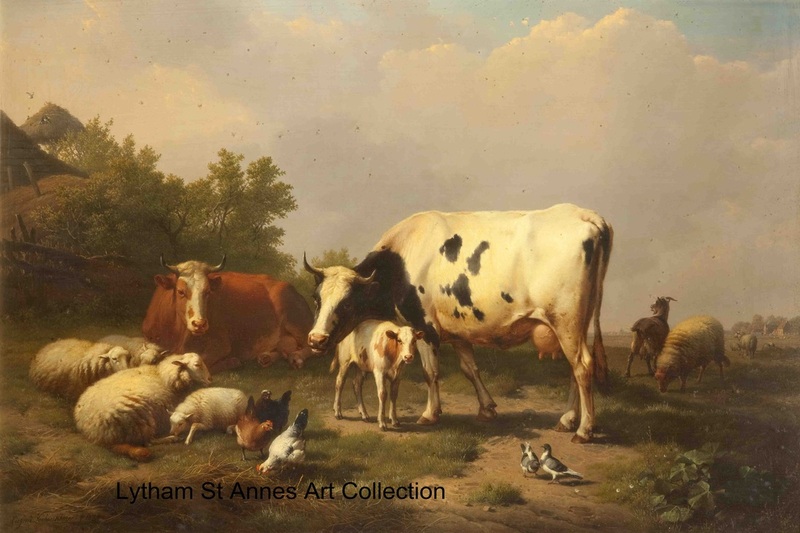 He was also influenced by the work of 17th century Dutch and Flemish animal painters, Paulus Potter and Albert Cuyp, whose rural scenes featured domestic animals in a landscape. Subsequently, pastoral settings containing cattle, sheep, goats and other domestic animals were to form the basis of his painting career. In 1820 he exhibited at the Academy in Ghent where his work was received with glowing praise. From this time Verbeckhoven’s career constantly moved forward with great success, one triumph leading to another. Four years later he exhibited at the Paris Salon, where again his work received very positive reviews, leading to international acclaim. Verboeckhoven visited Holland, England and Germany throughout the 1820s, absorbing the techniques of other painters. In 1827 he moved to Brussels and became involved in the struggle for Belgium Independence. He fought in the War of Independence and was appointed the Director of Museums in Brussels in 1831. During the 1830s the artist established his own studio and accepted students. He also set up a system of collaboration among his fellow artists. Some of the important Belgium painters at this time were Henri Campostosto, John Baptiste-De Jonghe, Alfred Verwee and Barend Cornelius Koekkoek. Verboeckhoven’s colleagues each brought well-established skills to the team, being assigned particular areas to work on by the Master. In the painting, Landscape with a Peasant and his Flock, circa 1850, the shepherd was painted by another artist whilst Verboeckhoven developed the landscape and the animals. Like Rubens, the demand for his paintings far exceeded anything he could produce single-handed. In 1836 the painting, Hungry Wolves Attacked by Travellers, was exhibited in the Brussels Salon. All his highly refined skills are evident, from the anatomical precision of the horses, wolves and humans to the depiction of the landscape. Horses rear in confusion and fear as their riders struggle to fend off the ravaging pack of wolves. This painting is now in the Rijksmuseum, Amsterdam and is considered one of his most famous paintings. During the 1840s Verboeckhoven travelled throughout Europe, always revising his ideas and exploring new ones. On his return to Brussels he started teaching at the Academy in 1845. During this time he added portraiture to his work. King Leopold of Belgium commissioned an equestrian portrait in 1852, thus combining Verboeckhoven's talent for both animal painting and portraiture. Verboeckhoven became one of the most famous and successful artists of his day. He exhibited in salons and many private galleries throughout Europe and his work was widely sought after in both Europe and America. He was awarded the French Legion of Honour, the Belgium Order of Leopold, the Portugese Order of the Christ and the German Iron Cross. Eugene Joseph Verboeckhoven died in Brussels in January 1881, aged 83. This oil painting is influenced by the style of Poussin. The black and white cow dominates the foreground with a calf and brown cow nearby. Six sheep, with more in the distance, merge into the landscape. Three chickens and two doves enhance the rural landscape and direct the viewer to the focal point, forming a triangle with the head of the cow. The soft pink and grey tones of the clouds are a contrast to the soft greens and earth tones of the land.